I want to wish you and your family a Merry Christmas. Yes, this is probably not the day Jesus was born. Yes, there are a lot of traditions that have been built up around it that are not biblical. The truth of today is still true. “For God the Father chose us in Jesus before the creation of the world to be holy and blameless in His sight.” Jesus was coming to that stable long before Adam and Eve ever blew it. 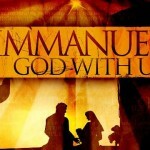 “The virgin will be with child and will give birth to a son, and will call Him Immanuel.” God already had a name picked out for that kid born in a stable hundreds of years before He was born – Immanuel, God is with us. God being you and me is not an after thought. It’s always been what the Father has wanted – a living, breathing, daily walk with us. This Christmas filter out the worthless worm thoughts about yourself. Insert the truth that God has always wanted to be with you. You are that important to Him.